Soon after music in the MP3 format started getting popular, the folks at SRS released a little blue plastic device that you hook up between your MP3 player and your speakers. There was a few dial adjustments on it to tune your music for more enjoyable listening. Then, a short time after iTunes was releases, SRS released a iWow software add-on for iTunes that did it’s magic in software rather than hardware. Like the old original SRS hardware, you can purchase a dongle for your iPad and iPhone to get a little more robust sound out of your external speakers. 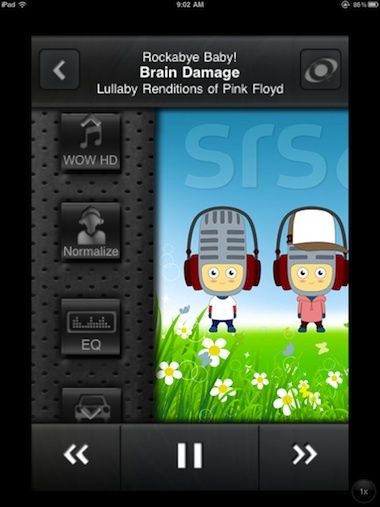 Now, SRS has release MyTunes for the iPhone, a software solution to do their magic all within your iOS device. While the software is not yet universal, and a iPad version is promised, this initial iPhone release runs just fine on the iPad. A team member put it well, music played with MyTunes sound much more ‘full’. Visiting SRS’s page, it appears they do more than just improve the highs and lows of the MP3 degradation. The output music is more robust causing individual instruments to become more clear… takes us back to those old spinning plastic disc days of the CDs. 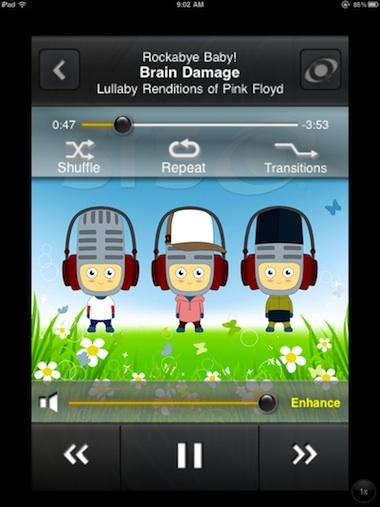 Launching MyTunes, you given a variety of ways to view your music and audio books. These are songs from your iPad’s iTunes area not including videos. Sweep left/right across the bottom of the screen to see your grouping options, tap to choose. 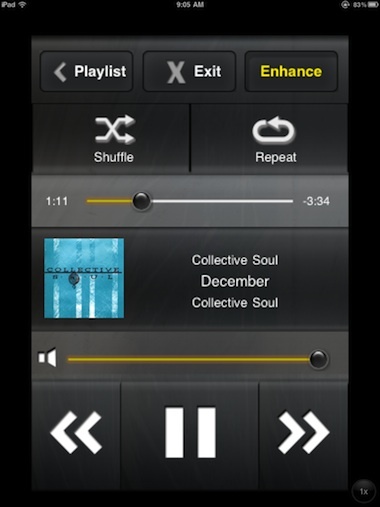 When a song is chosen, MyTunes presents a simple interface to interact with the song. For the first 10 minutes of use each day, you get access to the Premium features (can be in-app purchased to unlock, more below). The SRS button in the upper corner of the MyTunes screens causes a left button bar to appear. 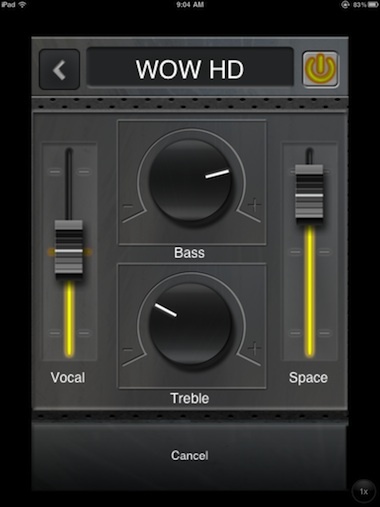 From here you can access the WOW HD, EQ and Normalizing adjustment screens. As well, jump to the Driving Interface. 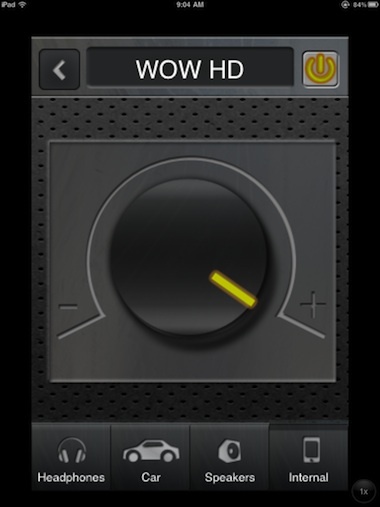 Choosing the top button gets you to the overall WOW HD tuning area. Each of the buttons along the bottom of the screen gives options to maximize your iPad audio experience. Headphones give you options like over-ear and in-ear headphones, speaks allow to adjust depending on the size of the speakers your iPad is feeding. 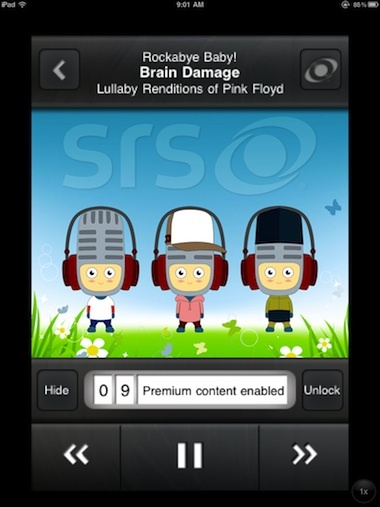 Tapping the upper/right ‘on/off’ button activates the full potential of the MyTunes software. 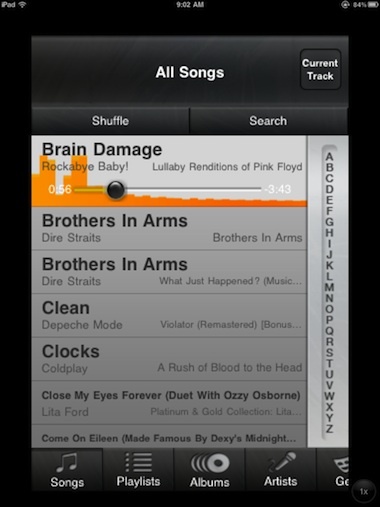 There are many areas within MyTunes to customize the way you like to hear you audio out of your iPad. We won’t go into everyplace these tuning options are within the app, we recommend you explore the app and adjust as you see fit. Most of us played and then went back to the defaults MyTunes presented us with in the beginning. After 10 minutes of use per day, the Premium features go away. 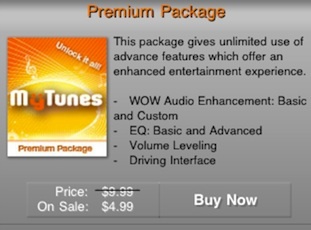 If you find that you wand access to more advanced features like more EQ adjustments, leveling of volume, the Driving Interface and the customer audio enhancement adjusters you can upgrade your copy of MyTunes (and all copies installed on the same iTunes acct) via an in-app purchase. One of the ‘advanced’ features of MyTunes is a Driving Interface. A simplified, large button full screen view so you spend less time taking your eyes off the road. At any time you can jump back to the list of music where MyTunes provides a graphic for the current playing song shows activity over the song title – like a graphic equalizer. 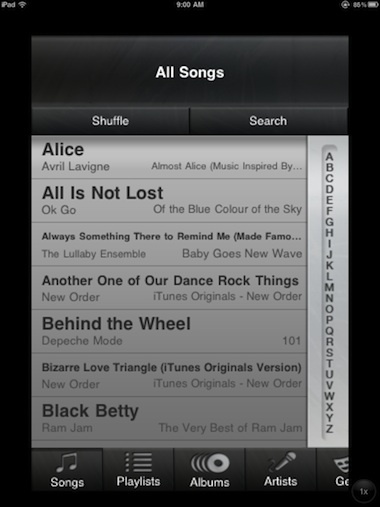 As well a progress slider shows location in the song and can be used to jump around the song if you wish.